With streaming getting crazy popular these days, its hard to stand out above the crowd. But one way to do that is to up your streams image quality from a low resolution and 30fps to a high quality 1080p 60 fps. The way you will be able to get the better quality and keep the needed performance is by having a dedicated streaming PC with a capture card. 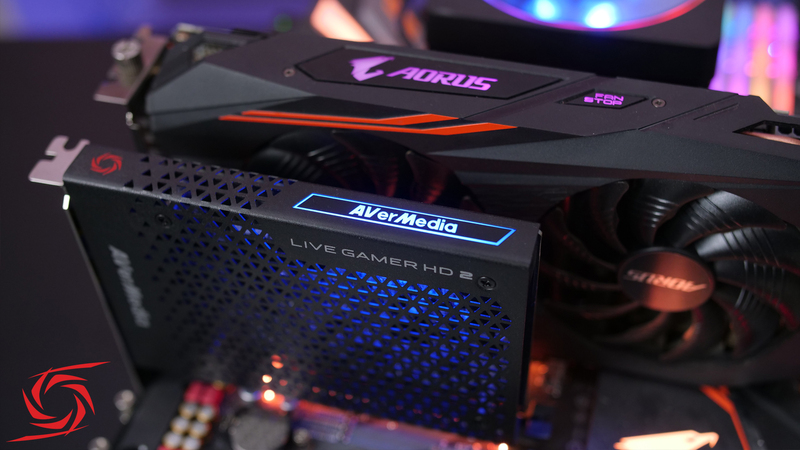 So say hello to the AVerMedia Live Gamer HD 2 one of the best capture cards on the market. The Liver Gamer HD 2 will help you bump up your quality without any issues. So firstly the AVerMEdia Live Gamer HD 2 will be a bit pricey for some, currently retailing for $185 on Amazon and around R3200 here in South Africa. So for the casual streaming it might be a bit too much but its a must have for streamers aiming for the best quality stream. Also AVerMedia has a bunch of over capture cards also available if you want something more affordable or even better.. So a quick rundown of the Liver Gamer HD 2 and how to set it up, it is a internal PCIe game capture card that is able to record up to 1080p 60fps perfect for streaming or just normal game recording. Inside the box you get the Capture card itself with this black metal cover and blue led AVerMEdia logo on the side, a HDMI cable and a 3.5 to 3.5mm cable. Installing and setup is quick, all you need to do is connect it to any PCI Express Gen 2.0 or higher port. Connect the HDMI cable from the gaming source to the HDMI In and if you want to you can run your display directly out from the the capture card with zero-lag or still run the display out of your GPU like you would normally. You also get a 3.5mm in and out port if you wanted to record audio from a different source or output to one. Also not only can you record your gaming system but if you have a console or even just a camera you will also be able to do the same. Just instead of connecting your gaming PC to the Liver Gamer HD 2 you connect the console or camera and it works the same. Now as for software the Liver Gamer HD 2 does not need any drivers so just install your preferred streaming or recording program like OBS, XSplit or AVerMedias RECentrer 4. Now you might be asking why do I need a capture card and a second PC. Well no, you can still use the normal method without a capture card, but if you are serious about improving the quality of your stream and gameplay then it is kinda essential. The reason being You can use 1 system do everything but you are going to need quite beastly CPU otherwise your quality is not going to look the best and you will take a performance hit. With a single system your CPU has to render the game and the streaming encoding which for most is just too much to ask. For example I played so games while streaming on my 8700K overclock to 5ghz and the best settings I could use is a very fast preset in OBS. Which caused my CPU to run between 80- and the high 90s which would cause lower quality and some skipped frames in the stream which we do not want. But when using a second PC to handle all the encoding and streaming work it frees up the CPU for higher Frames in Games and better quality stream on second PC. Now the game you are streaming also will make a big impact on the performance and quality of your systems. Some games don’t really use a lot of CPU power so you’re getting around 40% of CPU usage which does allow you to just use your single system to do the encoding on a lower quality. But for more intensive CPU games just for an example Ashes of the singularity, you won’t really be able to use yout your gaming system because the dropped frames will cause a unwatchable stream. WHere as if you use a streaming system it again frees up your CPU for better frames in game and a much smoother and higher quality stream. So to make sure just see how your system performs with that game to know on which quality to run. Even though the i7 930 was not strong enough to up the quality against the 8700K it helped lift the load of the 8700K for higher and stable performance. So if you have an older system with a bit newer and faster either i5, i7 or even Ryzen then you should be fine. Now of course if you don’t want to stream and just record gameplay footage the Liver Gamer HD 2 is going to work perfect for that as well and you wont need a second PC because your GPU will have an encoding chip built in to and take the load of your CPU. And just if you were wondering and new to streaming the reason you use your CPU to encode your footage instead of GPU is because the CPU can encode faster and in higher quality but not in at such a high bit rate that is why you use a CPU for realtime encoding and GPU for offline. SO again if you are looking to up your streaming game then a capture card like the Live Gamer HD 2 is definitely something you have to take a look at.